Plywood has always been a favorite material for home builders. The increase availability of good grade epoxies has further enhanced the reliability of plywood constructed vessels. The Gougeon brothers' wood epoxy saturation technique (W.E.S.T.) has advanced the use of laminated wood structures to a point where yachts can be built far stronger and lighter than was previously thought possible using any other material. Bray Yacht Design. Web Site Snapshot: If available, above is a snapshot of the Good N.E.W.S. 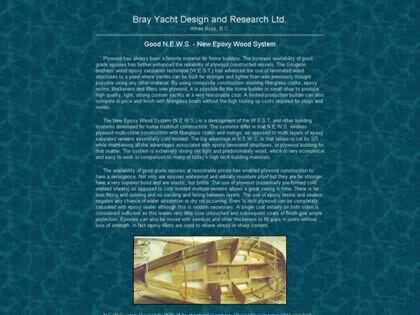 - New Epoxy Wood System web site at http://www.brayyachtdesign.bc.ca/article_news.html as it appeared when this site was added to the directory or last verified. Please Note that Boat Design Net has no involvement with the above web site; all content and images depicted in the above thumbnail are the property and copyright of Good N.E.W.S. - New Epoxy Wood System unless otherwise noted on that site. Description: Plywood has always been a favorite material for home builders. The increase availability of good grade epoxies has further enhanced the reliability of plywood constructed vessels. The Gougeon brothers' wood epoxy saturation technique (W.E.S.T.) has advanced the use of laminated wood structures to a point where yachts can be built far stronger and lighter than was previously thought possible using any other material. Bray Yacht Design.